Ahhh, Christmas. That beautiful time of the year when we celebrate the birth of our Savior, time with family and friends, delicious feasts and treats, & spending an insane amount of money on unnecessary crap that everyone is just going to forget about a month later. I have a love-hate relationship with Christmas. On one hand, I love the gifts. I love the mystery of seeing them under the tree, but not knowing what’s inside. I grew up with the idea of Santa Claus, and it was magical for me. On the other hand, I tend towards a minimalistic worldview and it truly bothers me the amount of wastefulness our culture tends to. Both with money and objects that are taken for granted. So this year, instead of letting my “Christmas Spirit” take over and buy everyone I know ten unnecessary gifts, we went with the minimum. How little could we purchase and still have gifts for everyone? How did we pick gifts that meant something and wouldn’t just get thrown into the pile? Below, I’ve included all the things I chose for this year, plus some from previous years. $1-10 – Print some special photos of you & your family. If you have a little more flexible Christmas budget, grab some cheap frames to put them in. If you really can’t afford much this year, give the photos in a beautiful Christmas card (you can get really big packs of cute cards for $1-2 at Walmart) and express your love for your momma. $15-25 – If you watch for a special sale on Shutterfly, you can almost always find one sometime in the fall. Start working on a family calendar earlier in the year and purchase it as soon as a calendar or all-store sale shows up! $5-25 – At Walmart, go check out the Pioneer Woman section! There are tons of adorable towels, mugs, dishes, glasses, and other kitchen knick-knacks that any woman would love! Just pick 2-3 items, at prices you can afford, and put them together in a cute bag. I guarantee anything from this brand will make any woman you know happy. $10-25 – Usually, you wouldn’t think about Bath & Body Works being something on a “budget” Christmas list. But, if you get in on the deals, it isn’t that bad! Almost always, you can get 5 wonderfully smelling soaps for $23. There is also always a buy 2, get 1 free or a buy 3, get 2 free deal on their body lotions, perfumes and shower products. While you would spend a minimum of $23 (for soap) – maximum of $71 (for 5 body products + 5 soaps), you could easily get gifts for 5-10 women for $71! Which isn’t bad at all, in my opinion. $5 – BUT, please, please, please, don’t waste your money on Bath & Body Works candles folks. Walmart has ah-MAZE-ing candles that look just like B&BW candles, and smell JUST as good! For $5! Don’t hesitate to grab one of these for some of the women in your life. $2-15 – Take note of your dad’s favorite candies, snacks, etc. You can just get one kind, make a basket with assorted favorites, or better yet – make your own! Baked goods and snacks creatively housed in mason jars, tins or Christmas-y Tupperware will look just as wonderful as anything you could buy! $5-25 – Buy one of your dad’s favorite movies, or a movie you are sure he would love, and add some microwave popcorn, candy, or baked goods in a little basket. The best place to look for movies first is the $5 bin at Walmart! But even if there are no good options there, you could choose to dish out $15-$20 for a full priced DVD. $10-25 – If your dad is a sports buff, consider getting him some fan gear! It doesn’t have to be anything expensive. A hat or simple t-shirt would be great. $15-25 – Grab a $15-25 gift card to a good restaurant. Offer free babysitting for the kids and there you go – date night in an envelope! Make sure to write a sweet little note along with it. $15-25 – If the couple you are trying to find a gift for is in a tight spot right now, whether they are saving for a wedding, a baby, or you just know they are financially struggling, consider a card with cash or a Walmart gift card! Sometimes these practical gifts are the most appreciated. $3-30 – Make some cute couples mugs! There are tons of great ideas on Pinterest. Grab some oil-based paint sharpies and some plain white mugs. All you have to do is write and/or draw your design, and then bake them! If you choose just black for your design, you will invest a lot less money on this. However, if you choose to make these mugs for everyone on your list, it would be worth it to invest in lots of colors! Plain white mugs at Walmart, or on Amazon, would range anywhere from $1-3 each. $5-20 – Desk/work supplies. Fill a little basket or box with pens, sticky notes, thumb tacks, paper clips, highlighters, etc. If it’s in the budget, buy a cute little organizer for their desk. $20-25 – Gas station gift card! $5-20 – Coffee or water tumbler that keeps things hot or cold for hours. They have tons of great options at Walmart. Fill it with their favorite candy! $5-20– A t-shirt or hoody with their favorite tv characters, movie quotes, sports team or superheroes. $10-15 – If you’ve got an alcohol lover in the family, make these adorable little DIY cocktail gifts! $0-5 – Creatively display how much you love them. A miniature journal, letters each day of the month (or of Christmas week), game cards hole punched together like a book… There are so many creatives ways to show them you love them! Go to Pinterest for some great DIY ideas. $10-50 – 7 days of Christmas! Pick 7 small and sweet gifts and add a corresponding love note to each gift. Ex: his favorite baked goods, his favorite candy in a cute coffee mug, a “reasons I love you” journal, a pack of new underwear, a new movie, and that hoody he has been wanting forever. Write a cute little note taped to it and make his whole week! $50-100 – A night away! Of course, this isn’t exactly cheap. But if you can find a hotel AFTER the Christmas rush, you’re bound to get some great prices (after New Years weekend is the best time of the year for good prices)! Organize a babysitter, print out some photos of the place you are staying, and don’t do anything while you’re there except for snuggle, relax and enjoy being without your children for one night. $2-5 – Women are so easy! Just look through DIY projects on Pinterest and pick one! My favorites are bath salts (Epsom salts + essential oil + adorable jar + ribbon), sugar scrub (sugar + coconut oil + essential oils + adorable jar + ribbon), or other fun projects and people will be so impressed with your skills, they won’t notice how little money you spent on them. $8-15 – Buy a cheap pair of fuzzy socks + fill with treats according to your budget. You could do all candy, or if you have a bit more to spend things like nail polish, lip gloss/chapstick, jewelry, cute hair bands/bows/etc. are always good. $5-10 – Grab a coloring book & pack of crayons/colored pencils. For an older girl, try a cute journal and some pretty pens. $10-25 – Check out these absolutely adorable, dainty, feminine necklaces on Amazon. They are affordable AND beautiful. Any girl would be so thrilled to receive one of these. 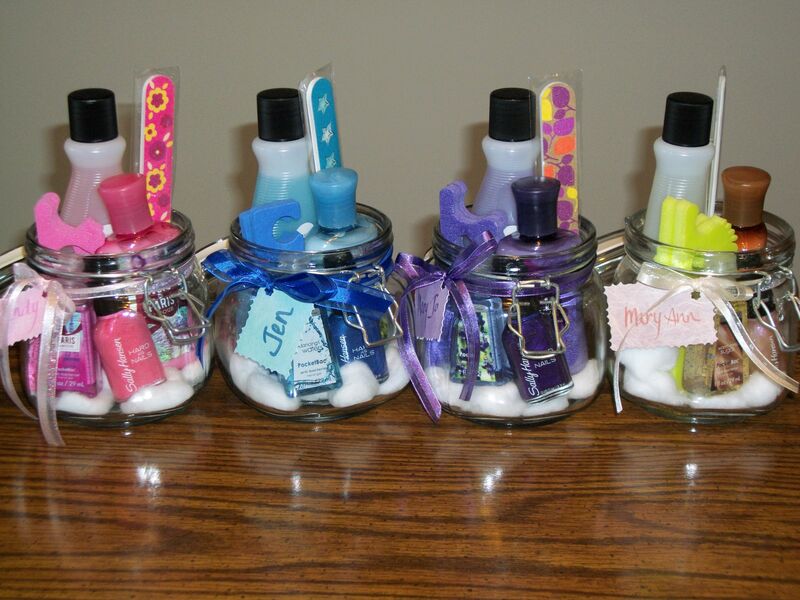 $10-15 – DIY manicure sets. For just a few dollars, you can put together a cute little manicure set for all the girls in your life. $5-20 – If you are buying for a set of siblings, grab a card game or cheap board game for hours of fun. You’ll kill two (or three or four!) birds with one stone! $0 – Write a note to the kid/s and invite them over to a fun sleepover at your house with popcorn/pizza/cookies and a movie! $5-10 – Boys love adventures. For little boys, try sidewalk chalk, jumping ropes, toy cars/trucks, action figures, walkie-talkies, “spy” gear, light sabers, or anything small toy/activity that will keep their busy mind captivated. $1-5 – Most boy moms attempt to limit sugar intake for their own sanity. You might just make that little boy’s Christmas by giving him his favorite sweet treats. $10 – Grab a t-shirt or hoody with your boy’s favorite superhero or character. $10 – Make a simple fleece blanket. Even if you don’t know much about sewing, with a good tutorial you can make a simple, square fleece blanket for the babe in your life! $2-5 – You can’t go wrong with a classic baby book, and it is so much better than toys! $5 – Diapers! Please, please, please consider buying diapers for the child in your life. Just one package of the size they are in will greatly help their parents. Remember: kids wear diapers until they are 2-4 years old! Just ask their mom what size they are in. $5-10 – If you really can’t help yourself, try picking bibs, socks, onesies or pajamas instead of those temptingly adorable fancy outfits. Their mom will thank you for the practical items. I hope these ideas were helpful to you! Here’s to a minimalistic & cheap Christmas for all! XOXO.